In the 32nd chapter of the book of Job, a young man by the name of Elihu became very angry with Job for justifying himself rather than God. He was also angry with the three friends, because they had found no way to refute Job, and yet had condemned him. “I am young in years, and you are old; that is why I was fearful, not daring to tell you what I know. I thought, ‘Age should speak; advanced years should teach wisdom.’ But it is the spirit in a man, the breath of the Almighty that gives him understanding. It is not only the old who are wise, not only the aged who understand what is right. “Therefore I say: Listen to me; I too will tell you what I know. I waited while you spoke, I listened to your reasoning; while you were searching for words, I gave you my full attention. But not one of you has proved Job wrong; none of you has answered his arguments. Do not say, ‘We have found wisdom; let God refute him, not man.’ But Job has not marshaled his words against me, and I will not answer him with your arguments. “They are dismayed and have no more to say; words have failed them. Must I wait, now that they are silent, now that they stand there with no reply? I too will have my say; I too will tell what I know. For I am full of words, and the spirit within me compels me; inside I am like bottled-up wine, like new wineskins ready to burst. I must speak and find relief; I must open my lips and reply. While I am not “young in years,” I can relate to Elihu’s claim that he is “full of words”. The Spirit also compels me to speak and find relief. I too must open my lips and reply. 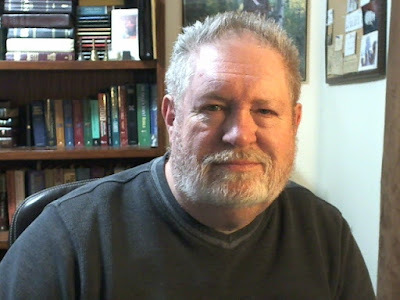 Ever since I returned to the fellowship of Alcoholics Anonymous, I find that I cannot help but speak of how God rescued me from the pit of “incomprehensible demoralization.” Much to my surprise, my testimony has been well received. There only seem to be a handful of folks that cringe or roll their eyes when I give God all the credit for my recovery. Perhaps it is how I relate my experience or perhaps it is the joy I exude when speaking; or a little of both. Whatever the reason, I rejoice and praise God for the opportunity to serve Him and to draw others to Him. Of note, an avowed agnostic and an intellectual atheist have asked me if I would take them through the 12-steps of A.A. Both of them asked me immediately following a meeting wherein I had shared my faith in God! What an honor and a privilege to be used by God in such a powerful way; it is truly humbling. The following is an article that wonderfully illustrates how natural it is to share our faith when our life has been changed by God. For the New Testament Christians, witness was not a sales pitch. They simply shared, each in their own way, what they had received. Theirs was not a formally prepared, carefully worked-out presentation with a gimmick to manipulate conversation, and a “closer” for an on-the-spot decision. Rather, it was the spontaneous, irrepressible, effervescent enthusiasm of those who had met the most fascinating person who had ever lived. The gospel is not theology. It’s a person. Theology doesn’t save. Jesus Christ saves. The first-century disciples were totally involved with a person. 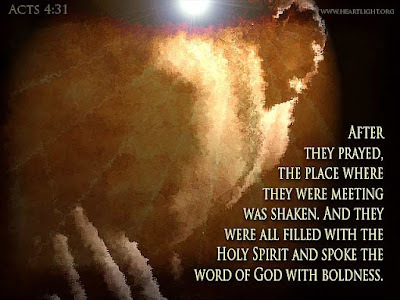 They were followers of Jesus. They were learners (students) of Jesus. They were committed to Jesus. They were filled with Jesus. They had encountered Jesus Christ and it simply could not be concealed. They witnessed not because they had to, but because they could not help it. Their school of witnessing was the school of the Spirit where they learned continuously. Authentic Christian witness is born of the Spirit. Madison Avenue, with all its sophisticated know-how, can’t improve on the strategy. Nothing is more convincing than the simple, unembellished word of a satisfied customer. American business spends millions of advertising dollars annually in an attempt to achieve it. The simplest Christian does it effortlessly when he tells a friend what Christ means to him. "But when the Holy Spirit comes to you, you will receive power. 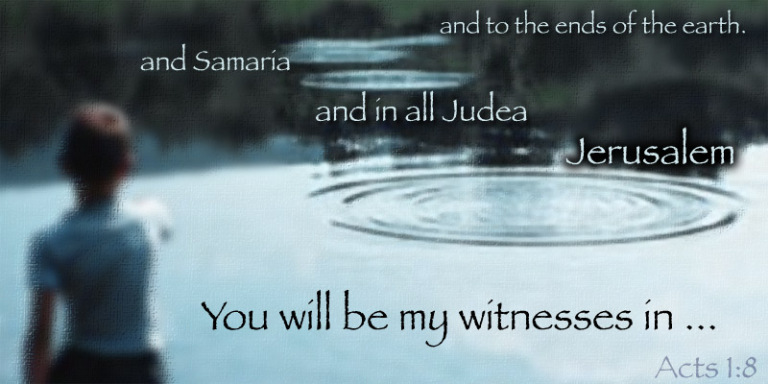 You will be my witnesses—in Jerusalem, in all of Judea, in Samaria, and in every part of the world."